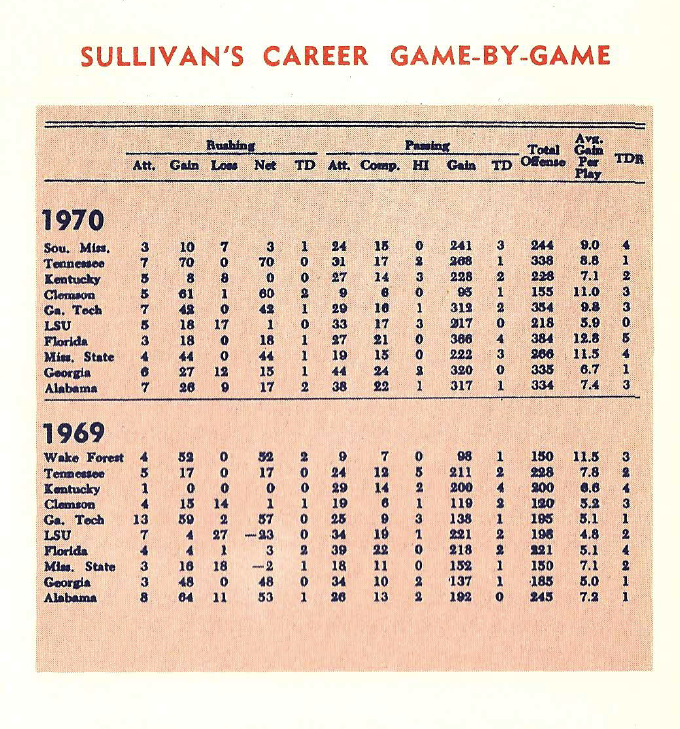 Here’s the statistic-packed brochure the Auburn Athletics Department sent out to “gentlemen of the press” as a testament to Sully’s Heisman Trophy worthiness. Most everyone agrees that Sullivan won the award with his senior year performance against Georgia (which Auburn won thanks to Georgia students). You can read about what happened after the game here. And you can see some rare candid photos from Sullivan’s Heisman banquet here. And you can help keep posts like coming by supporting TWER via Patreon here. As if “of Irish descent” is needed with a name like “Sullivan,” lol. I do find it funny (and kind of odd) that this was mentioned in the brochure, though. I also found it funny that they included the stat about no player from a school where John Heisman ever coached had won the Heisman Trophy. how’d the Iron Bowl turn out that year? I can’t remember how 1971 turned out, but I sure know about ’72. How’d bammer’s Heisman boy do in the Iron Bowl last year?